The jeweler's workbench - Much like an office desk, the jeweler's workbench is where they spend most of their time. Here, all of their tools are conveniently within reach along the inside edge of the C-shaped cut out, along with the bench peg which is situated at the center where most of the filing and work is done on. The leather skin seen hanging from the workbench is called a "lemel" and is used to catch the precious metal shavings and scrap from cutting, filing, drilling, and polishing the rings. these leftovers are saved up and melted down to pay for this jeweler's holiday bonus! 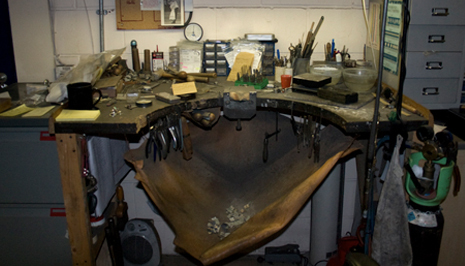 The workbench of one of our jewelers. This was what he called 'cleaned up for a photo shoot'! Ring Mandrel - Also known as a "wheat-sheaf ring stick", "ring gauge", "ring stick", or "ring sizer stick". This is a conical shaped metal stick used to measure ring sizes and/or size rings up or down. The ring is slipped onto the stick and falls to stop at the marker for the size of its leading edge. The 'wheat-sheaf' trademark was developed to maintain an accurate scale of measurement across the jewelry industry. 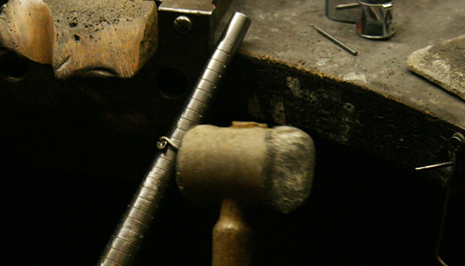 A ring mandrel and mallet being used to resize a ring. Hammers - used for resizing rings on a ring mandrel for example, among many other uses. The 'hammered' finish used for many wedding rings isn't just a term, we use actual hammers to create that finish. A 'ball pien hammer' is the preferred hammer of choice for this finish. Planishing hammers, raising hammers, blocking hammers, chasing hammers, mallets, and riveting hammers are examples of other hammers used in our jeweler's workshop. Piercing saw - A smaller version of a fret saw and looks like a coping saw, used for work that requires fine detail on jewelry. The deep frame and fine blade gives it high maneuverability. The piercing saw gets its name from the process of making 'blind cuts or 'piercings' where a hole has been drilled through the piece of jewelry and the blade is threaded through the hole and attached to the saw frame. Files - these are typical files made of steel that come in all shapes and sizes used to file down metals, much like a nail file for finger nails. Some files have a concaved shaped, used for filing the insides of rings, others are perfectly flat making them ideal for filing the sides of rings down uniformly. We also have really small 'needle files' which are used in the finishing stages of jewelry making. 'Riffler' files, which more resemble dental tools than an a file, have various shaped ends that are ideal for reaching those nooks and crannies for detail work, like between prongs for example. Sandpaper - various grades of emery paper (sandpaper made for metals) are wrapped around a wooden stick, known as a 'buff stick', to finish jewelry before polishing. Pretty high-tech eh? Eyeglasses, loupes, and magnifiers - Because of the fine-detail nature of jewelry crafting, various types of magnifying glasses are used to keep jewelers from needing glasses prematurely. Not to mention the essential function and importance of viewing the characteristics in diamonds and gem stones for grading purposes, for which a 10X magnification piece is typically used. 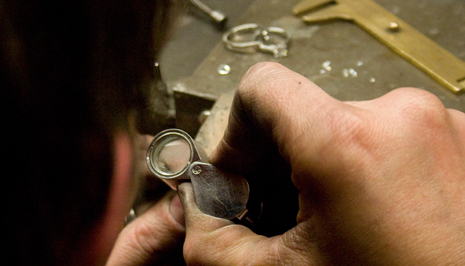 A jeweler's loupe is used for quick detail checks, like viewing the metal hallmark or the progress of filing work. An eyeglass or monocle is used for extended periods of viewing detail work. Other types of magnifying glasses used are head mounted ones, either on their own headset or mounted to regular eye glasses, as well as large bench mounted magnifying glasses that typically have their own lighting. Vernier calipers - an extremely precise measuring instrument used to gain an additional digit of accuracy compared to a simple ruler. Sort of a combination between a drafting compass and a sliding ruler. For additional accuracy, we also have digital gauges that measure electronically at up to a 1/100 of a millimeter used for primarily for measuring gemstones. Stone setting tools - specialized drill bits and burs, attached to the jeweler's flexshaft (like a Dremel) are used to prepare the setting. Pushers, beading tools, millgrain wheels, burnishers and hammer drills are used in the actual setting and finishing process. 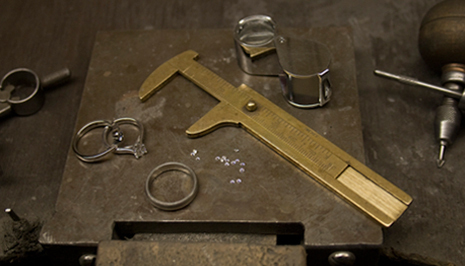 We use ring clamps and wax sticks to hold the piece of work steady and in place for setting. Arkansas oil stones are used to sharpen setting tools.